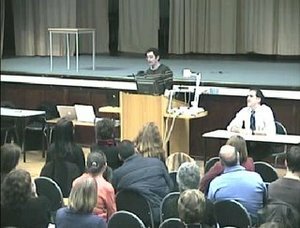 The video/audio of the lecture David and I delivered at Jordanhill, the Education Faculty at the Uni of Strathclyde, is up and his post reveals how we managed the feedback of students. It was nice to meet some of the students afterwards and see how different technologies got different people so excited. I can't wait to see what happens with this group as they head into the world of the classroom. David's got some of the things we used on a special del.icio.us page that the students (and you) can use to see what we were talking about for yourself. I'm going to forward more of the ones we mentioned there over the next few days to populate it a bit better.